I may have a soft spot for librarians. If you read my bio on Games vs Play you’ll know that my one true love and the mother of my sons, dear Priscilla Jane, is my stalwart librarian-companion for whom I would unhesitatingly move the world if needed. Or indeed, if she asked. But weirdly enough it was another librarian who first introduced me to that most famous of all role-playing games, the great-granddaddy that started it all. I speak of Dungeons & Dragons, of course. 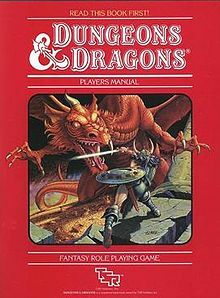 The first time I played D&D was in the winter of 1985. I was in Grade 5 of a rather conservative primary school on the outskirts of Melbourne’s southernmost suburb, which for reasons known to myself I will call Vandaltown. I’d been aware of the existence of this strange game that was played without a board but with a fistful of multi-sided dice ever since I’d read the novelisation of E.T., where Elliot and his little mates were playing D&D on the night E.T. became stranded on Earth. But I had no idea just how different, just how immersive the game would be, until that first Friday afternoon in the school library. It blew my young, white suburban mind. Honestly, the teachers may as well have handed out LSD at morning recess. Perhaps most amazingly now that I look back on it, the dungeon master was none other than the head librarian at the school, one Mrs Edwina Beeble. What the hell was going on here? 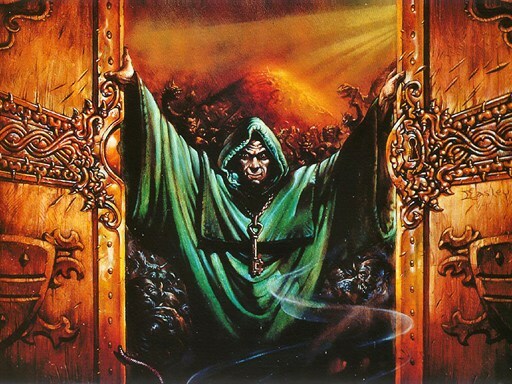 Remember this was 1985, the very height of the D&D-satanism moral panic, and like I said this school was somewhat to the right of Ronald Reagan when it came to politics. It came down to this: every second Friday afternoon our class would separate into four or five groups to take turns working through a series of non-curriculum based but supposedly “character-building” activities (the D&D is pun intended). Undoubtedly this filled a scheduling gap in the teaching cycle, and gave all but the four teachers who volunteered to lead these activities an afternoon off. My memories of the other activities are sketchy. I think there was a tie-dying group, in which I ruined a good few of my father’s shirts, and some kind of “non-competitive” but nonetheless physically punishing sport like dodgeball. That an activity as morally suspect as D&D was included in this lineup I imagine was solely through the urgings of Mrs Beeble herself. In a school that openly promoted mediocrity and imaginative timidity as key performance indicators among its teaching faculty, Mrs Beeble was something of an iconoclast. Naturally many of the kids – and needless to say their parents – distrusted her on sight, but she didn’t seem to care. Her library was her inviolable demesne, and once inside you had to play by her rules. Which were simple: no food, no drink, but you could stay as long as you wanted and read whatever you liked. Naturally, Mrs Beeble and I forged an unshakeable alliance that endured the six years I spent in that conservative primary school on the edge of Vandaltown, Melbourne’s southernmost suburb. But it was an alliance that would be sorely tested. Though I wasn’t an especially early reader, once I started I quickly became a precocious one. I was always hungry for new books. Mrs Beeble must’ve seen the germ of the young nerd growing in me, and rather than nip it in the bud decided to let it grow free. 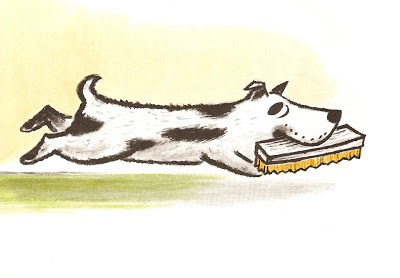 By the start of my second year at the school I had exhausted the picture books of the “Young Readers” section in the library, with their truncated narrative structures and transparent moralizing. What I wanted was the full scientific names of dinosaurs. I yearned for the thrills of a space opera, I puzzled at the faintly macabre cutaway diagrams of butterfly pupae. The truth is, while my classmates were grappling with the existential intricacies of Harry the Dirty Dog, I was wondering what lay at the bottom of the stairs in the lower level of the library, the so-called “Older Readers” section. Only problem was, I wasn’t an “Older Reader” yet, and wouldn’t be for a number of years. It wasn’t long before word got around that Mrs Beeble was letting me read books from the lower, forbidden floor of the library. In what might’ve been a show trial in another time and place, my grade teacher actually made me read out loud from books picked out at random to prove I was as literate as I claimed. All the while Mrs Beeble was forced to look on, seething in anger. I distinctly remember her hissing through gritted teeth, “This is my library, and these books are meant to be read!” But thankfully this story has a happy ending: after demonstrating that I knew the ‘ph’ in “pheasant” was pronounced like the ‘f’ in “FUBAR”, I was grudgingly allowed free range of the library. As for Mrs Beeble, in my final year at the school she won the state lottery, an event which nobody had seen coming, let alone her. She spent the winnings wisely, buying herself a red sports car in which she drove off into the sunset, never to return to teaching. At her farewell I was chosen to present her with a rather unctuous bouquet of flowers in front of the whole school. I very nearly disgraced myself by bursting into tears, a catastrophe averted only when I saw how happy Mrs Beeble was to be leaving a school run by the Stepford Wives. As far as I can tell, the school didn’t look for a replacement librarian until at least the mid-‘90s, although thankfully I was well out of there by then. But back to that first game of D&D. 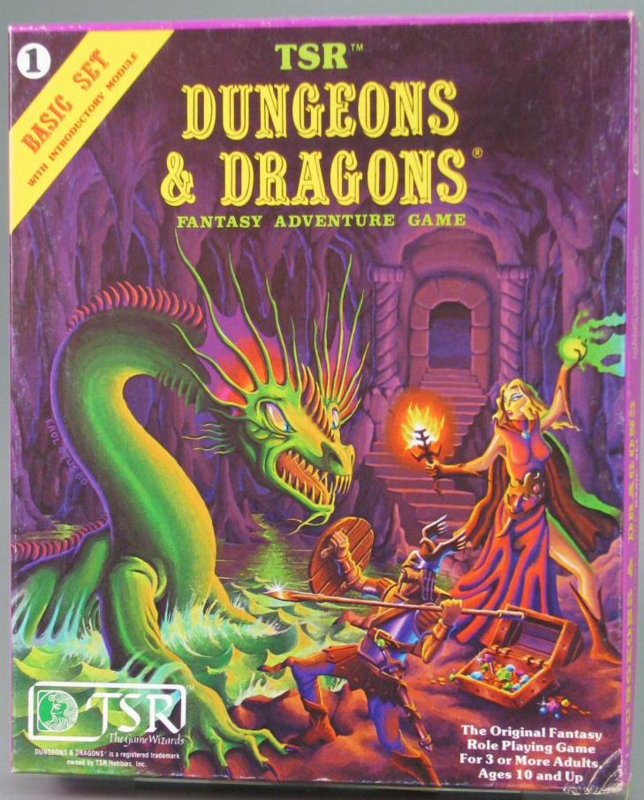 This was the 1981 Basic Set, which D&D fans have subsequently dubbed the “magenta box” (to distinguish it from the perhaps better known “red box” edition from 1983). I just looked that up on Google, of course. Back in 1985 it looked like a purple box to me, but one with a huge green dragon on the front. 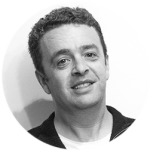 The process of character generation seemed completely natural to me as I rolled the three six-sided dice – or “3d6” as I learnt it was said – and assembled the bare bones of my character: Strength, Intelligence, Wisdom, Constitution, Dexterity, Charisma. This being Basic rules, the characters were basic too – just Fighters, Clerics, Thieves and Magic-Users, plus those so-so non-human races. Honestly, who’d want to be a halfling? Like a lot of young nerds I went for a magic user, and was rewarded with two measly spells, one of which was a magic arrow that I could fire only once. The other spell I can’t remember, but it was probably “Speak Marmoset” or something equally useless. The other players were four kids from my class (that’s my class at school, not my character class – see what I did there? ), all of whose names I have regrettably forgotten but whose player characters I recall very clearly: a fighter, a cleric, a thief and a dwarf, plus my magic user. All first level, of course. I’m certain Mrs Beeble surreptitiously nudged us in the right direction to put together a party with the optimal mix of skills to survive our very first dungeon crawl. Finally, in the last half hour of that first session, we entered the dungeon. Looking back, it was as basic an adventure as you can imagine. We walked down a gloomy corridor – it took a while for all the kids in the group to realise this is what we were doing – but we made it to the end, eventually. 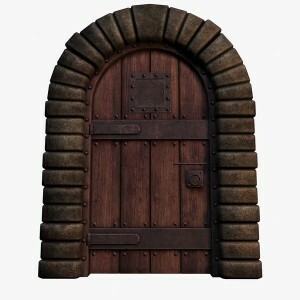 There was door in front of us, thick and wooden with an enormous brass handle, said Mrs Beeble. There was perplexed silence from our group. And with that question, the game became immersive. This is what set asides roleplaying games from everything else: the immanent freedom in that one question that underpins all the dice rolling and table checking and other game mechanics that puts off so many people. You can keep your Scrabble and Monopoly, I thought at the time, and I still think so now. No other type of game starts with a question, and ends with you finding your own answer. It was literally like entering a different world, one that we created in our words and in our minds while all the time seated around that cramped little table in a corner of the school library. “I want to go through this door,” I said. Mrs Beeble smiled. And through the door we went. 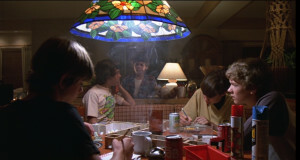 Image sources: Banner image – Nerdarchy; D&D Basic Set “red box” – Wikipedia; D&D scene from E.T. – My Side of the Laundry Room; Harry the Dirty Dog – The Wayback Machine; D&D Basic Set “magenta box” – Pinterest: D&D door – D&D Adventure.